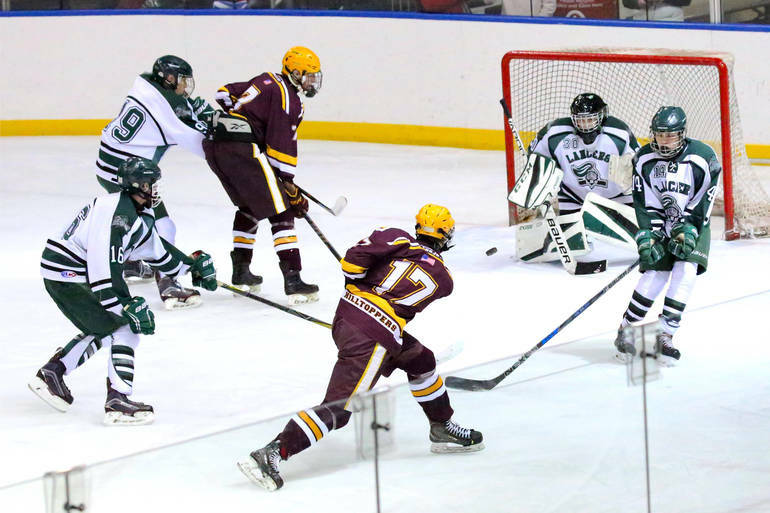 WEST ORANGE, NJ – Junior Tom Pryymak scored three goals and freshman Grant McCormack earned the first shutout of his Hilltopper career as the Summit High School Boys Varsity Ice Hockey Team defeated Livingston 4-0 at the Codey Ice Arena. Special teams played a key role in the Maroon and White victory, with two goals coming while Summit had the man advantage and one of the trio of Pryymak tallies arriving when the Hilltoppers were short-handed. Summit took a 2-0 lead after the first period. Pryymak scored at the 10:10 mark, assisted by senior Davis Strabley and junior Spencer Myers, then Pryymak struck again on the power play just over five minutes later assisted by senior Luc Radice. The Hilltoppers doubled their advantage with two more goals in the second period, with Pryymak scoring an unassisted goal at 11:51 with his team a man down, and senior captain Charlie Collins — with assists from junior Jake Puskar and Pryymak — firing home with the boys from the 07901 a man up at the 3:37 mark. McCormack turned away all 12 shots he faced. Summit, now 2-0 on the season, will next take on Westfield December 4 at the Warinanco Skating Center. Face-off is set for 6:30 p.m.